NBC’s THE VOICE Season 5 Episode 13a “Top 20” Team Adam and Team Blake – Recap. “The Voice” coach Christina Aguilera opened night one of the Live Shows by performing with Flo Rida. Looking Smart In a Coma! A post wedded Shelbie Z revealed to Blake that she wants to be an “all country artist.” Blake was excited about that. Singing “Fancy” by Reba McEntire who was Blake’s Adviser during the shows first season. Being a Geek and Awesome! Blake said, “Dude, you can’t be a geek and be that awesome. It’s impossible. I’m glad that you mentioned that last performance because before that I was on the fence about you.” He complimented his confidence for performing a capella. Christina expressed her thoughts, “I’ve always known that you have this incredible vocal range. What you were able to do is you really grounded yourself in this song.” She said he drew people in instead of making it boring. Blake saved Nic from going home during the battles when Adam chose Nic’s opponent. He says his fans are called “The Flawk”, A combination of his last name and a flock. Nic sings “Blurred Lines” by Robin Thicke Blake said Nic is a triple threat because he can sing and rap. Blake said he thinks Ray’s performance is going to be the one of the night. Christina said that was the most connected that she has seen Ray and that he brought a “kind of realness” she had not yet seen. CeeLo’s reaction to Ray’s performance was, “I love this grit and real. I’m really excited about how well everything’s connected and how well everyone’s performing under live pressure. Adam said, “She Talks To Angels one of my favorite tunes. The only thing I was confused about – you ride scooters, but you don’t ride Harleys.” He offered to take Austin on a ride with The Voice host Carson Daly who owns one. Not Leaving the Door Open! She used to “gig” at night and work retail during the daytime hours. Adam said Grey is the one to watch out for. Grey’s dad used to work construction during the day and play gigs at night. Adam is trying to get her out of the “wedding singer” like style of singing. She is singing “Still Into You” by Paramore. Adam stole Will back from Christina last week. Will was performing in Casinos and hotels before The Voice. Adam said he loves how talented Will is without being cocky. Will is singing “Secrets” by One Republic. Ex coach, Christina said, “I have a special fondness for you when you were on my team for a second. You definitely put your soul and heart into it. He is with a Christian rock band. “Being on the voice has brought new life back into me.” His Dad had cancer one year ago, but is now cancer-free. “Preston is in the business of making something his,” said Adam. He’s singing “Nothing on You” by B.O.B. ft Bruno Mars. He said when CeeLo turned his chair for him, “Everything was slow motion” but he chose Blake as his coach. Cole joked that even his beard has a Twitter account. She was singing background vocals for Jimmy Cliff before she came onto The Voice. She said this is her chance to be a solo artist. Since ‘The Voice’ She’s been on the cover of newspapers in Jamaica and got a phone call from Bob Marley’s son. 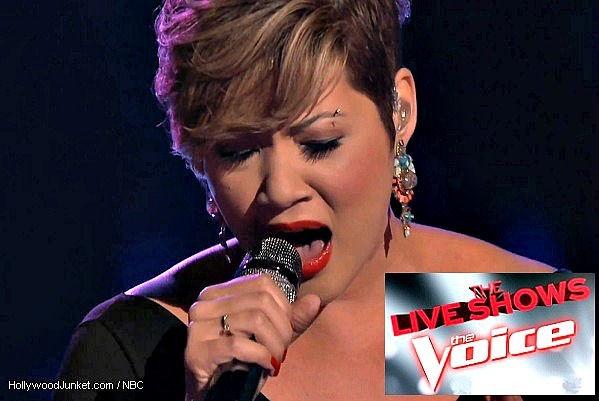 WATCH – THE VOICE Season 5 Episode 13a “The Live Shows Premiere” originally aired by NBC on Monday, November 4, 2013. UP NEXT – Check out all the highlights from THE VOICE Season 5 Episode 13-B and Episode 13-C in our article Three Hearts Just Broke! THE VOICE – Live Shows Night 2 and Eliminations Recap!